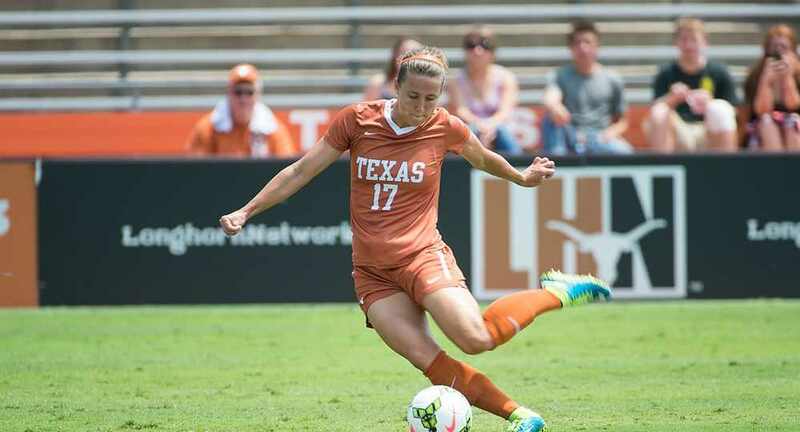 Forward Kelsey Shimmick scored the game's first goal to give Texas an early lead at UCLA (photo courtesy of texassports.com). The University of Texas women’s soccer team got back to the .500 mark with an enormous victory, knocking off No. 14 UCLA on the road in front of a crowd of 1,160 despite being outshot by the Bruins, 21-8. Senior forward Kelsey Shimmick got the Longhorns on the scoreboard first when she scored in the fourth minute of the game off an assist from defender Ali Schmalz, and freshman Alexa Adams scored what proved to be the game-winning goal when she scored unassisted in the 61st minute by dribbling past UCLA goalkeeper Cassie Sternbach, who had fallen to the ground, and slipped her shot past two scrambling Bruin defenders. Senior Texas goalkeeper Abby Smith surrendered a goal to UCLA’s Lauren Kaskie in the 76th minute, but also posted a career-high 11 saves in the victory. The victory bumps the Longhorns’ record to 2-2-1 for the season; three of UT’s five opponents — No. 5 North Carolina, No. 18 Ohio State and now No. 14 UCLA — have been ranked in the National Soccer Coaches of America Association (NSCAA) rankings at the times they played Texas. The Longhorns played eight opponents ranked in the top 25 in 2014, including a 1-0 loss to UCLA when the Bruins were ranked No. 1 in the country. UT’s only win against a ranked team last year came in an overtime victory over then-No. 6 Texas Tech. The Longhorns return to action with a pair of home matches this week, hosting Oregon State at 6:30 p.m. Thursday and Abilene Christian at 1 p.m. Sunday. Both games will be broadcast on the Longhorn Network.